A bright, fruit-forward Bourbon from California’s Wine countryside. Steve Gertman began his working life in the production departments of car-themed TV shows, including Top Gear, among others. But on a trip to Scotland, he fell in love with Whisky — as a lot of us have. Instead of dreaming, he put his passions into motion and founded the first legal distillery in Santa Barbara County since Prohibition — opening his distilling doors in 2013. Business has been good, to say the least. His Ascendant Spirits Distillery has grown steadily and now offers a range of Breaker Bourbons, three Whiskies, four Vodkas, and a Gin. When you first look at Breaker Port Barrel Finish Bourbon you are struck by the brilliant rose color of the Bourbon. It’s almost like they forgot to empty the Port Wine casks before they put the Bourbon in. The sourced spirit is fully matured, a sweeter profile Bourbon finished in first-fill Port casks, yielding a fruit-forward Bourbon unlike any we’ve tasted before with a bright, garnet hue. Call it the Rosé of Bourbons… or Bourbon in the new California style. 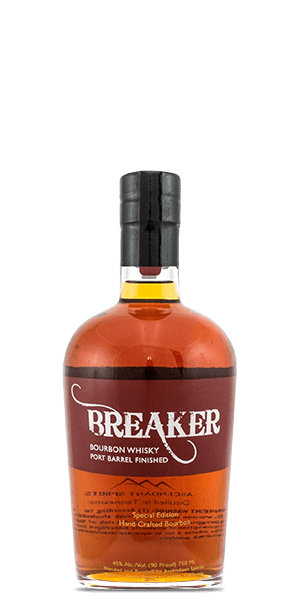 The Breaker Bourbon line gets it name from the local surfing waves — breakers — rolling just off the coast of El Capitan beach. What does Breaker Port Barrel Finish Bourbon Whisky taste like? The Flavor Spiral™ shows the most common flavors that you'll taste in Breaker Port Barrel Finish Bourbon Whisky and gives you a chance to have a taste of it before actually tasting it. On the nose you find dancing and mingling aromas of grape, demerara sugar, raw grains, cinnamon, and maple. The thick mouthfeel has a flavor-blast of molasses, pecans, concord grape, worn leather, and a bit of heat. The finish is medium length, sweet, and a bit oily. I wasnt super ompressed with this one It wasn't bad per-se, it just didnt have the deep port finished flavour I thought it would given other ratings. Average. Loved this one! Very smooth right from the first sip. Port casks from Northern CA provides magical flavor to this bottle, excellent! One of the best five year aged bourbons you will taste.